Our onsite team of experienced technical engineers provide refurbishment services across all makes and models of cooling towers and evaporative condensers nationwide. 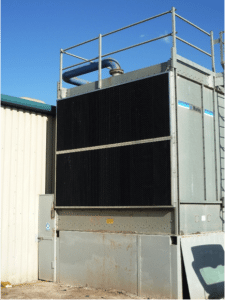 Refurbishing your cooling tower not only extends its useful working life but can also improve the thermal performance beyond that of its original design specification. Vistech offer refurbishment services and solutions designed to improve performance, reduce operational running costs and increase the safety or your cooling towers. Replacement of packing, drift eliminators and sound attenuators with world-class high-efficiency designs. Anti-legionella packing / drift eliminators for enhanced protection in difficult-to-clean areas. The biocide-impregnated plastic is wash/ leach resistant for up to 5 years. 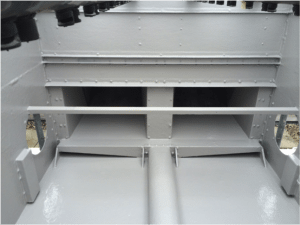 High performance GRP linings and paint finishes to repair corroded cooling tower casings and fans. Stainless steel replacements for corroded mild steel parts to ensure enhanced life and reduced maintenance. CleanSafe flooring and access doors/ systems for safer cleaning/ removal of packing and maintenance/ inspection of drift eliminators. 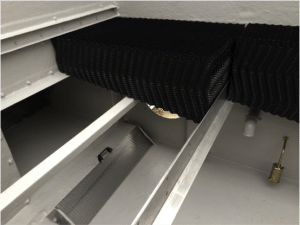 Sound attenuators to replace corroded/ damaged sections. 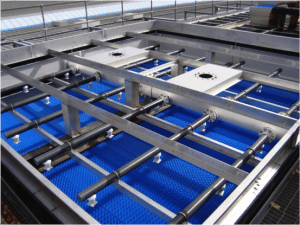 To find out more about how Vistech can help you with your cooling tower refurbishment project contact our technical sales team here or request a quotation.